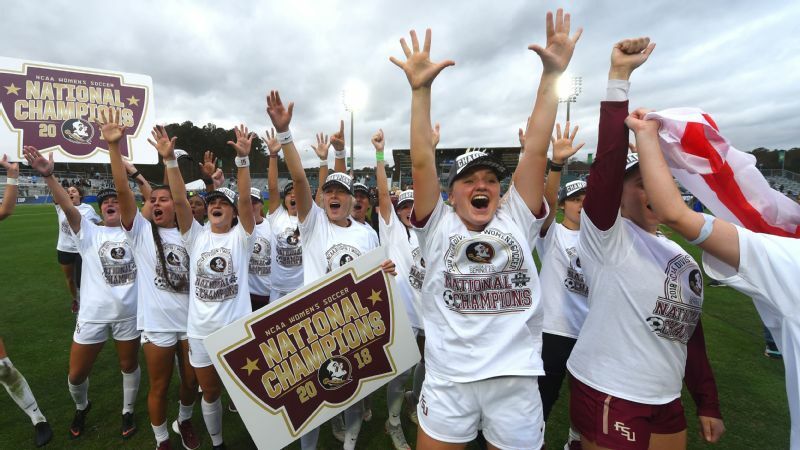 Julie Foudy credits Florida State for providing "a glimpse into the future" of women's soccer and looks back on senior Dallas Dorosy's playoff performance. Dallas Dorosy's second-half goal was the difference in Florida State's 1-0 win over North Carolina. CARY, N.C. -- Natalia Kuikka played a lot of soccer to get another chance to step on the field at WakeMed Soccer Park in the College Cup. She threw her body into a lot of tackles, logged a lot of miles and spent a lot of hours in ice baths to get back here. She took a fair few final exams, too. She was a freshman who played all 90 minutes for Florida State when it lost to Duke in a 2015 semifinal in Cary. So there was more than a little extra satisfaction to stand in the same place Sunday and lift a national championship trophy above her head after a 1-0 win against North Carolina. "Playing my last year and my last game, I just wanted to win it so bad," Kuikka said. "I think it's every girl's dream to win a national championship." Except it isn't every girl's dream to win a national championship, at least not our college national championship. It certainly wasn't Kuikka's dream growing up in Finland, the northern European nation wedged sometimes precariously between Scandinavia and Russia. She knew a little bit about this vague soccer entity called Florida State because Finns Sanna Talonen and Emma Koivisto are among Florida State coach Mark Krikorian's many former international players. But the rivalry with North Carolina? The ACC? The College Cup? Not so much. Somewhere along the way, she became the woman who struggled for words after Sunday's win, not because of any language barrier, but because words in any language were inadequate for the accomplishment. "I never really knew about college soccer until Mark gave me a call," Kuikka said. "The standard that we have [at] Florida State, wanting to win games, and now I [had] a goal I can work for -- I'm kind of speechless, but it means a lot. Not a lot of girls back in Finland can say that they are national champions in USA, or not even in Finland. It means a lot. It means I'm playing my best soccer, and playing against amazing girls like UNC. ... I'm proud of myself, as well." And somewhere along the way, Florida State's soccer melting pot helped transform the program into one that can topple mighty North Carolina and challenge any as the best in college soccer. "Players from around the world bring different styles of play," said Florida State midfielder Jaelin Howell, the College Cup's most outstanding defensive player and one of the team's Americans. "I think that's really what a lot of the international girls bring. I think it helps everybody's game grow, and we can implement the different styles of play to help the whole team grow." 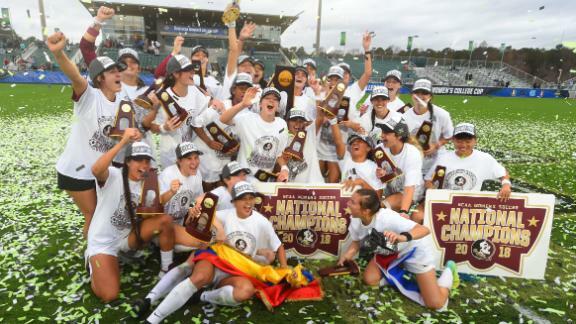 Florida State celebrates after winning the 2018 national championship with a 1-0 victory over North Carolina. That melting pot certainly helped the Seminoles win against the Tar Heels on Sunday. Kuikka and Howell teamed up to lead another shutout, and Venezuelan Deyna Castellanos and American Dallas Dorosy teamed up for the game's only goal. 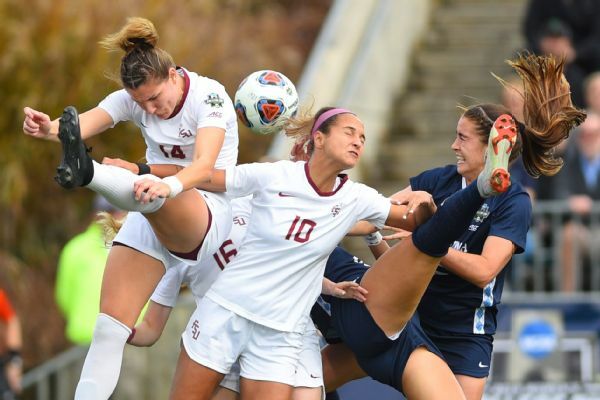 Florida State's international flair -- which Sunday included Kuikka, Castellanos, Chinese midfielder Yujie Zhao, English midfielder Anna Patten and Canadian defender Gabby Carle -- is nothing new. Japan's Mami Yamaguchi won the program's first Hermann Trophy. Iceland's Dagny Brynjarsdottir led the Seminoles to their first national title. Including the United States, current or former Seminoles have played for the full national teams of 16 countries. The global recruiting eye came with head coach Mark Krikorian when he was hired before the 2005 season. His rosters with the WUSA's Philadelphia franchise and at both the University of Hartford and Franklin Pierce College were similarly dotted with international talent. "It's a great opportunity for the right kid," Krikorian said this weekend. "If a kid wants to come in and perfect their English, if they want to work toward a university degree, if they want to combine sport with study, the American system is fantastic." 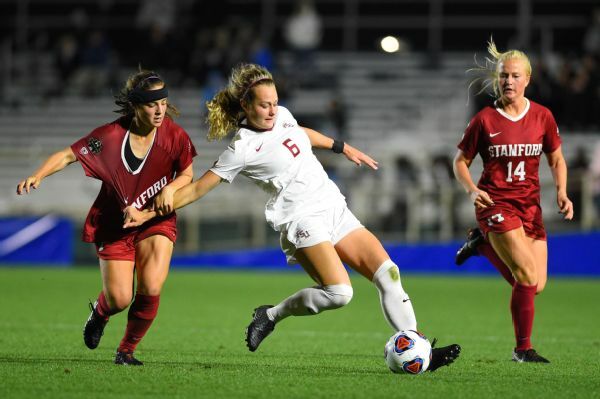 Other programs recruit internationally -- Canada's Jessie Fleming (UCLA) and England's Alessia Russo (North Carolina) and Grace Fisk (South Carolina) are among the current stars (although Russo missed the College Cup with an injury). But for no other elite program is it as much a cornerstone. 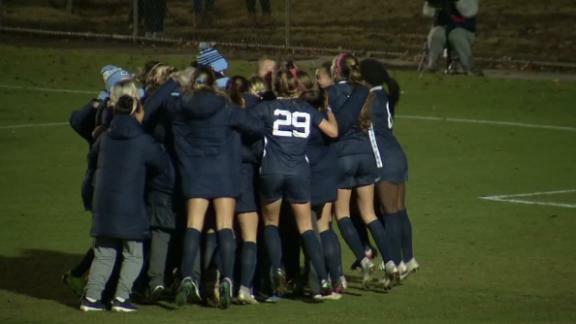 "He's earned this right to recruit the elite foreign player, and I genuinely respect him for it," UNC head coach Anson Dorrance said the day before the final. "Because I know in a living room, if I'm going head-to-head with him [for] an American ... 75 percent of the time, I'm going to get them. Just like when I go head-to-head with Stanford, 95 percent of the time Stanford is going to get them. "So I have no issue with what he's doing, and I respect him." Dorrance makes big, bold points, and there might be some hyperbole in his statistics. Florida State hasn't lacked for homegrown talent, from current U.S. national team defender Casey Short to Howell, a freshman who has already spent time training with the full U.S. team. But darn if the winning goal didn't, painfully for him, underscore Dorrance's point. Natalia Kuikka (14) and Deyna Castellanos (10) are two big reasons the Seminoles topped the Tar Heels on Sunday. Quiet much of the game against an opponent that knew better than to let her get any room in the attacking third, Castellanos made the most of one moment of brilliance. With two Tar Heels near her on the right side, she still found the sliver of space to drive a ball across the face of goal in the 60th minute. It was a pass worthy of a player who, albeit controversially, was last year among the finalists for FIFA women's player of the year and has a social media following -- 1.2 million Instagram followers -- on par with Carli Lloyd and Lieke Martens, her fellow finalists that year. Judged on that kind of reach, Castellanos is far and away the biggest star in college soccer, maybe women's college sports. 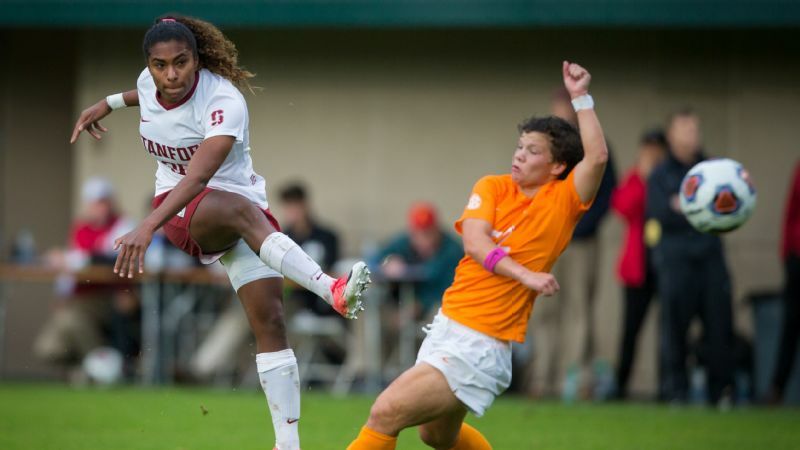 "She's much different than all of the different players I've had," Krikorian said. "Over the years, I've had a chance to coach a lot of good ones, whether it be here at the collegiate level or the WUSA and the professional level or whatever, but I don't know anybody that's got 1.2 million Twitter followers or Instagram, whatever it is she has. "I have no idea how it would be to try and have that celebrity. At home, she's a national hero in some ways. Here, she's come in, in a new language and new culture, and just done a great job." On the other end of the pass Sunday was Dorosy, who perhaps ironically beat North Carolina defender Lotte Wubben-Moy, an English youth international, in a battle for position and threw her leg -- and her whole body -- at the ball. 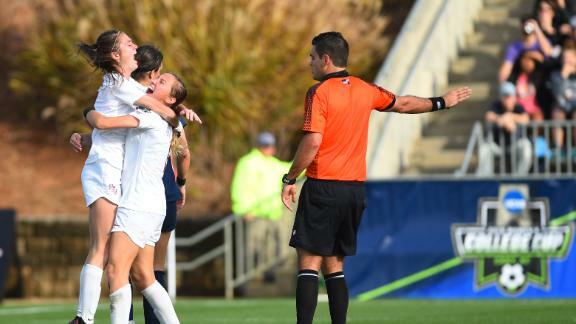 A sub for much of her senior season, Dorosy scored five goals in the postseason, including two in the ACC tournament final against North Carolina and the winner Sunday. American players get better at Florida State, too. "For a coach that works with a player day after day after day, it's nice to see them rewarded for the hard work they put in." Here's the thing about Florida State and North Carolina after three meetings this season. We don't really know who is better. Three games in a row decided by one goal, each team winning at least once on (essentially) the other team's home field. The point isn't that Florida State is demonstrably better than North Carolina or even that it played a demonstrably better game. The point is that Florida State has become a program that puts itself in these kinds of positions more than any other program, making more College Cup appearances since Krikorian's arrival than North Carolina, Stanford, UCLA or any other program. It is arguably the most consistently excellent program of the past decade. Be excellent for a decade and you will win a title or two. Florida State felled both Stanford and North Carolina in the College Cup with patient, technically sound, possession soccer. It is an international style, one made easier to play with players who grew up in youth systems that emphasized those traits more than they are emphasized in many American settings that prioritize results and athleticism. But it works only if the pieces fit together, if -- as Castellanos put it over the weekend -- her Latin style and Zhao's Chinese style, Howell's American style and all the rest meld into one Florida State style. It has to be about the people, too. 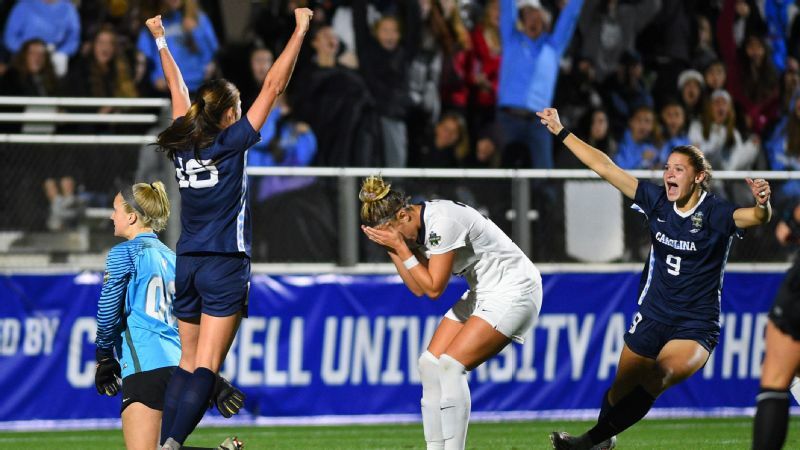 They have to come to care about things such as the College Cup, as Castellanos appeared to as she celebrated with her country's flag on the field after the game and as Kuikka did as she tried to find the right words. Kuikka had never lived away from home when she arrived at FSU. She wasn't sure where to find Finnish food in Tallahassee, reliant on her mom to send packages with the necessary seasonings to fake it. She wasn't sure enough of herself or her second language to say much on the field her first season or two. But she looked across the ocean and saw an opportunity worth chasing. "Back home, we have actual seasons," Kuikka said. "We have snow, so that [makes] soccer difficult. We don't have grass -- only for like six months, basically -- which obviously makes it hard. But it teaches you grit and surviving in other means. It would come to running in snow and putting yourself into super-cold weather. But in Tallahassee, everything is perfect. We have a nice pitch, we have a nice facility for lifting and running and all of that." She will complete her degree in 3½ years and graduate this winter before moving on to professional soccer. She will probably go back to Europe, although NWSL teams might perk up at hearing her she say she isn't opposed to the idea of staying in the U.S.
She has learned what is increasingly unmistakable about the women's game: It's global. "Soccer, it's kind of like a language," Kuikka said. "When you play, you learn it." Florida State is fluent in it. And it sits atop the college soccer world at the moment as a result.